"With chaos threatening to engulf Lebanon, the need to resolve the conflict in the Middle East has rarely seemed so urgent. The Op-Ed editors went to seven experts with experience in the region, asking each of them what should be the first step toward defusing the crisis." On Friday's World News, ABC's Charles Gibson highlighted a Lebanese blog poster who implied that most Israelis are not "reasonable" enough to care about the safety of innocent Lebanese civilians. Responding to an Israeli poster, also quoted by Gibson, who had expressed wishes that the Lebanese people be safe during the airstrikes, the unnamed Lebanese poster implied that most Israelis are unreasonable while complimenting the Israeli poster: "I can rest a little easier in this difficult time because I have found reasonable voices in Israel." GMA's Vargas: When Will US Get on Euro/UN Bandwagon and Condemn Israel? Everyone knows that when it comes to winning wars and achieving peace, the model to follow is that laid out by France, other Europeans, and the UN. Elizabeth Vargas, steadfast Euro-UN-ophile, is savvy enough to recognize that the US needs to fall in line behind wiser heads and 'condemn or rebuke' Israel. Sadly, an obdurate Bush administration, in the person of spokesman Tony Snow, just wasn't getting the message in a Good Morning America interview this morning. Vargas: "Tony, this is day ten now of the conflict in the Middle East and only now is the US government considering sending Secretary Rice to the region. Why waiting so long to do so?" Snow: "Well, first, Elizabeth, you have to understand even though Secretary Rice hasn't been to the region, we've had a high-level . . . delegation . . . there last week. . . Secretary Rice thought she would wait until we had a moment . . . when the time is ripe. Now she views this as a good time to go." Vargas: "You mentioned European allies. The US has thus far been alone in its refusal to either rebuke or condemn Israel for its excessive force, as Kofi Annan called it last night. And in addition it has refused to call for any cessation of hostilities. At what point does the administration say to its close ally Israel, 'enough'?" 'Today' never showed us just who was holding that placard. But judging from his comments this morning, just how surprised would we be to find it was NBC's David Gregory himself? "The president's foreign policy was designed to make the the Middle East safer. It's not." "Crisis after crisis has undermined the Bush doctrine." "A foreign policy that has yet to produce the promised results." 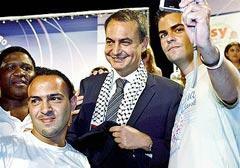 Kaffiyeh, Or Just Another Cold Day in Madrid for Spanish PM Zapatero? They laughed when I said, here and here, that wearing a Palestinian scarf has become a leftist fashion statement. It was just a cold day on Rockefeller Center, people explained. Well, what do you know? Looks like the cold of Rock Center has made its way all the way to Madrid - and in high summer, no less! Something very surprising happened on Wednesday: Comedian Bill Maher actually said something positive about America’s current president. Now, in fairness, his statements were written and published at The Huffington Post, which means that maybe only 500,000 people will read them as compared to his larger audience on HBO’s “Real Time.” And, it remains to be seen whether Maher will share such sentiments with his television audience. Heart-rending images of small children being lifted across a fence. Outraged American/Lebanese evacuees alleging indiscriminate Israeli bombing ["they are bombing streets, gas stations, food stores, ranches."] A crying Lebanese man with blood on his shirt after his brother was killed by an Israeli bomb. And the only two reporters on the scene reporting from . . . Beirut. That was the way the 'Today' largely saw fit to cover the Middle East conflict this morning. Take the Anti-Neo-Con Test: Who Said It - Matthews or Buchanan? It is axiomatic that the goal of the foreign policy of the United States should be the advancement of the interests of the United States and not of any other country, no matter how sympathetic, including Israel. 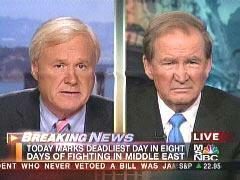 That said, should it not give Chris Matthews pause that his pointed anti-neo-con spiel has become indistinguishable from the well-rehearsed Pat Buchanan line on the matter? Has Israel already gone too far, waged too successful of a counterattack against an incursion and double kidnapping by the terrorist group Hezbollah? As the assault on the Syria-and-Iran backed terrorist group goes on over Lebanon, the Times takes a breath and begins to revert to its usual biases.